Abstract. In this paper, we present an innovative CH4, δ13CH4, and C2H6 instrument based on cavity ring-down spectroscopy (CRDS). The design and performance of the analyzer is presented in detail. The instrument is capable of precision of less than 1 ‰ on δ13CH4 with 1 in. of averaging and about 0.1 ‰ in an hour. Using this instrument, we present a comprehensive approach to atmospheric methane emissions attribution. Field measurements were performed in the Uintah Basin (Utah, USA) in the winter of 2013, using a mobile lab equipped with the CRDS analyzer, a high-accuracy GPS, a sonic anemometer, and an onboard gas storage and playback system. With a small population and almost no other sources of methane and ethane other than oil and gas extraction activities, the Uintah Basin represents an ideal location to investigate and validate new measurement methods of atmospheric methane and ethane. We present the results of measurements of the individual fugitive emissions from 23 natural gas wells and six oil wells in the region. The δ13CH4 and C2H6 signatures that we observe are consistent with the signatures of the gases found in the wells. Furthermore, regional measurements of the atmospheric CH4, δ13CH4, and C2H6 signatures throughout the basin have been made, using continuous sampling into a 450 m long tube and laboratory reanalysis with the CRDS instrument. These measurements suggest that 85 ± 7 % of the total emissions in the basin are from natural gas production. 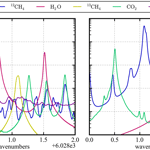 How to cite: Rella, C. W., Hoffnagle, J., He, Y., and Tajima, S.: Local- and regional-scale measurements of CH4, δ13CH4, and C2H6 in the Uintah Basin using a mobile stable isotope analyzer, Atmos. Meas. Tech., 8, 4539-4559, https://doi.org/10.5194/amt-8-4539-2015, 2015. We describe an innovative instrument based on cavity ring-down spectroscopy that analyzes the stable isotopes of methane in the ambient atmosphere. This instrument was used to study atmospheric emissions from oil and gas extraction activities in the Uintah Basin in Utah. These measurements suggest that 85 ± 7% of the total emissions in the basin are from natural gas production. The easy field deployment of this instrument can enable similar regional attribution studies across the world.